Garrison Artillery; discharged to enlist. Height 5 feet 9 inches. Weight 142 lbs. Chest measurement 34-38 inches. Complexion fresh. Eyes blue. Hair brown.Sight, hearing, colour vision, heart and lungs all normal. Limbs and chest both well formed. Full movement of joints. No illnesses. Free from hernia, varicocele, varicose veins, haemorrhoids, inveterate or contagious skin disease. Good bodily and mental health. Vaccinated. No slight defects. No fits. Deemed Fit. Two hearts pierced by arrow tattoos on left forearm. Tattoo mark on right forearm. 17 November 1916 while at Cairo, admitted to Military Hospital Citadel, and on 19 November discharged to the General Hospital at Alexandria. On 26 Novemebr 1916 he was admitted with Gonorrhoea, and discharged on 8 December. In April 1917 admitted to hospital with dysentry. In August 1917 and again in September 1917 admitted to hospital with diptheria; reported improving. Owen was the third son of Mr & Mrs Edward CARR, of Waihao Forks, Waimate. He was educated in Temuka (at St Joseph's?). In 1916 and 1917 he was admitted to hospital several times. Owen was first reported as 'missing, believed dead' after the action at Amman on 30 March 1918. He was not reported as a Prisoner of War. As a result of the finding of a Court of Enquiry on 28 October 1918, he was declared 'Killed in Action'. By the evidence of one who was with him on 30 March and who accompanied the burial party over the ground of the action on 20 September 1918, a pair of britches known to belong to Carr, as 'they were sewn up the back with string in a peculiar way', was found on one of several bodies buried in a grave on the battle field. Another found a hat which was recognised as Carr's; moreover, it had his name written inside. There was a bullet hole through the hat at the front, and another at the back. On revisiting the body identified as Carr's, they found the skull had bullet holes similar to those in the hat. They were poisitive in their identification and believed that death would have been instanteous. His brother Edward Martin CARR was killed in action on 27 March 1918 at the Somme, and another, John Joseph CAR, was killed in action on 30 March 1918 in the Palestine - on the same day and in the same conflict as Owen, and is buried in the same cemetery. Thus their parents lost three sons in a matter of three days. 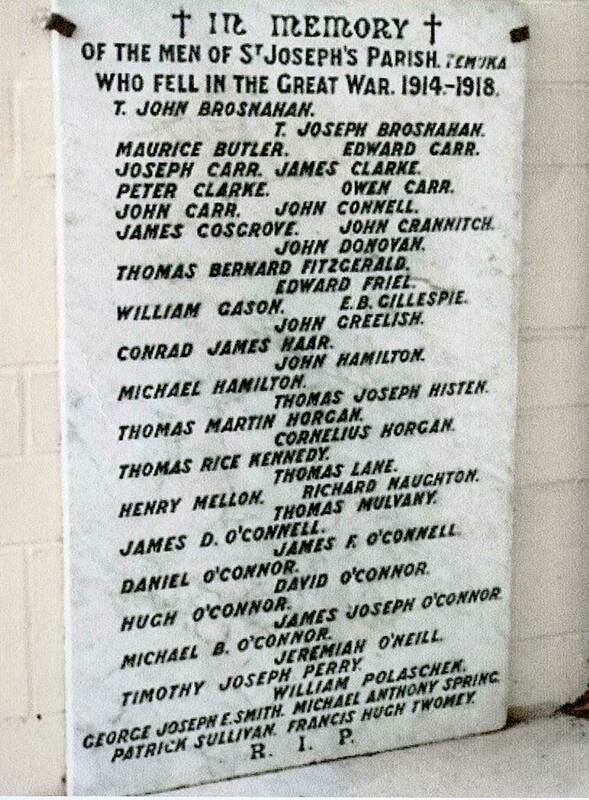 In addition, their uncle John CARR, a brother of their father Edward, was killed in action on 13 August 1918. Owen was well known and well liked in the district. He left no will. Advice re his Medals was forwarded to his father, Edward CARR, of Waihao Forks. Plaque and scroll were sent to his father..